This paper, based on original research and interviews with 10 members of the Syrian American diaspora, explores the dynamics of migration flows and how these changed with the onset of the Syrian conflict, as well as the emergence of organizational structures but also new lines of fractures. While the priorities of the Syrian American diaspore prove heterogenous, all participants in this study expressed a need, to varying degrees, for continued diaspora support in the transition and reconstruction of post-conflict Syria.1Research for this article was conducted through analyzing secondary literature and interviewing members of the Syrian American diaspora throughout the U.S. The interviews serve to provide an understanding of the behavioural dynamics between the diaspora groups. Every effort was made to maintain a gender balance among the interviewees: four participants were female and the remaining six were male. Participants were selected from states identified as having a large Syrian population or the presence of Syrian American organizations. The interviewees belong to various religious, ethnic, and professional backgrounds. Additionally, they have diverse regional origins in Syria and have spent varying amounts of time in the U.S.
Syrian immigration to the United States occurred in two distinct waves, the first in the late 19th century and the second in the 20th century. These immigrants mainly settled in large urban cities such as New York, Boston, and Detroit. During these two periods, records show that around 1,000 Syrians from Damascus and Aleppo officially entered the United States annually. During the first wave, many of these migrants were from Christian villages, fleeing religious persecution and political unrest, or seeking economic betterment. However, in 1924, the U.S. Congress passed the Johnson-Reed Quota Action, enforcing quotas to limit the number of immigrants from all national origins. This resulted in a cease of migration from Syria that persisted until the 1965 Immigration Act was passed. The implementation of the Immigration Act marked the beginning of the second wave of immigration as it eliminated the national-origin quota system. The majority of migrants during the second wave were Muslims moving to escape war and persecution, as well as for education, employment, or family reunification. 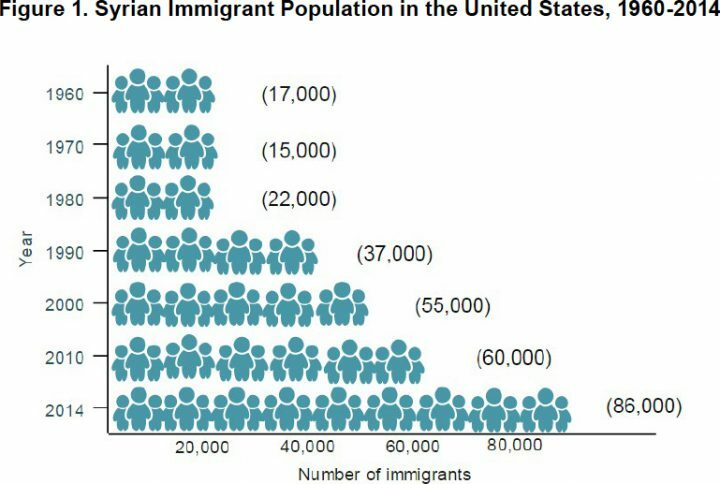 The American immigrant population of Syrian origin currently represents nearly 0.2% of the total immigrant population.2Gaby Semann, "Arab Americans: Stereotypes, Conflict, History, Cultural Identity and Post 9/11", Intercultural Communications Studies Vol.23 No.2, 2014. According to the Migration Policy Institute (MPI), Syrian immigrants become naturalized citizens at a much higher rate than other immigrant populations, due to the fact that many Syrians enter the U.S. legally.3Jie Zong, “Profile of Syrian Immigrants in the United States” The process of applying for naturalization is quite involved and includes paying fees, passing exams (both English and civics), interviews, and swearing an oath of allegiance to the United States. As such, naturalization is a strong indicator of integration.4David Dyssegaard Kallick, Cyierra Roldan, andSilva Mathema, "Syrian Immigrants in the United States". Syrian Americans, particularly men, are well-educated, and, compared to other immigrant populations, are more likely to have completed a post-graduate degree. The accomplishments in higher education among the Syrian population in the U.S can be explained by their average age, 47 years old.5Jie Zong, “Profile of Syrian Immigrants in the United States”. This makes the majority of the Syrian population older than other immigrant populations as well as the American-born population.6David Dyssegaard Kallick, Cyierra Roldan, andSilva Mathema, "Syrian Immigrants in the United States". Syrian populations in the U.S. have also been economically successful. Compared to other foreign and American-born populations, Syrian-Americans are more likely to work in skilled occupations, such as in education services, health care, social services, and in the retail sectors. The Syrian skilled worker earns an average annual income of $52,000, a higher average when compared to the salaries of other immigrant and American workers. Additionally, around 11% of Syrian immigrants are business owners. This is double the rate of business ownership among other immigrant populations and three times the rate among American citizens. The most prominent types of business among the Syrian population are medical offices, food services, and automobile dealerships.7David Dyssegaard Kallick, Cyierra Roldan, andSilva Mathema, "Syrian Immigrants in the United States". The average earning of a Syrian business owner is approximately $72,000 annually. 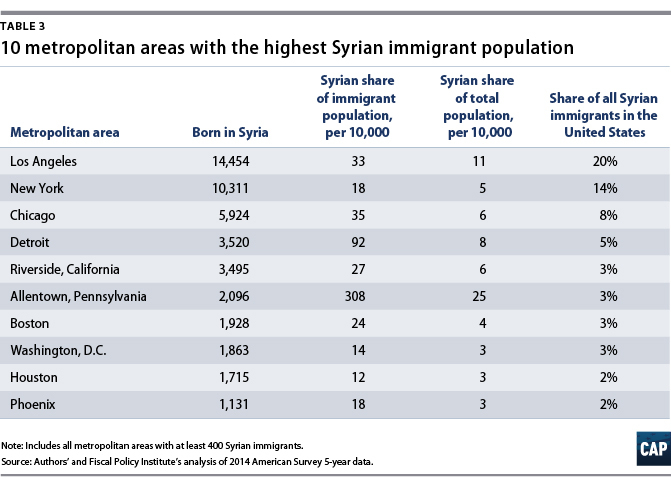 The Syrian American diaspora is not a homogenous community. It is diverse, with different ethnicities, regional origins, demographic characteristics, and religious groups. Before 2011, Syrian Americans did not closely interact, and political groupings were limited; different diaspora groups coalesced solely based on their professions, place of origin, family ties, and religious backgrounds. For example, doctors and business owners would gather amongst themselves within their states of residence but the two groups would not associate with each other.8Omar Salem, telephone interview, 17 May 2017. While Syrian-Americans encountered other members of the diaspora at mosques or churches, groupings were regional and based on location in the U.S. When diaspora members socialized, they identified, above all else, as Syrian. 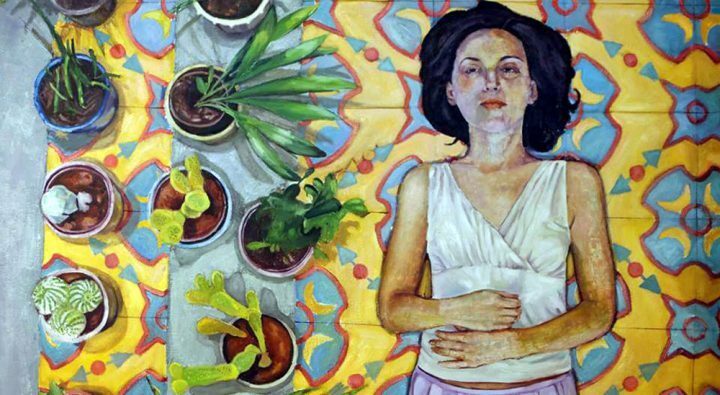 Some organizations, such as the Syrian American Clubin Texas, and the Lebanese Syrian American Junior League, existed long before 2011 and aimed to strengthen the bond among the Syrian and Lebanese communities, to facilitate integration in the U.S., and to celebrate shared heritage. Based on interviews with members of the diaspora, ties within the Syrian American community were weak and unorganized, in part due to the large geographic size of the United States as well as the lack of institutions to unite the diaspora. Even though intermingling among the diaspora was mostly social, there were two exceptions: the Syrian American Medical Society (SAMS)and the Syrian American Council (SAC). SAMS, established in 1998, is a professional association that provides “networking, education, cultural, and professional services” to Syrian American physicians. In 2005, SAC was founded as the first political Syrian American organization. SAC’s founders were members of the “old opposition” who had fled Syria in the late 1970s and 1980s and who sought to provide international support for local Syrian civil society to reform the Syrian regime following the U.S. intervention in Iraq. To avoid the same fate as Iraq, the founding members positioned themselves as interlocutors between the U.S. and the Syrian governments rather than advocating for U.S. military action in Iraq. The rifts between the Syrian diaspora have also been intensified due to the security culture in Syria. This security culture has instilled fear and mistrust between the diaspora. As Moss writes, this has subsequently “de-politicized the diaspora’s speech and social life and rendered anti-regime activism a high-risk activity. As such, only a minority engaged in opposition activities abroad, and no public membership-based transnational advocacy organizations existed before 2011.”9Dana Moss, "Diaspora Mobilization for Western Military Intervention During the Arab Spring", Journal of Immigrant and Refugee Studies, Vol.14 No.3, 2016 (Dana Moss, “Diaspora Mobilization for Western Military Intervention during the Arab Spring”). After 2011, the Syrian American diaspora began organizing based on their political views. For many, it was the first time to meet other Syrian Americans outside their families. The increasing political divides centred around support for the Syrian government or the opposition. The Sunni diaspora members largely supported the opposition while the Syrian Christians predominately sided with the government. However, there were many exceptions and neither group was homogenous. Some Christians have challenged the assertion that they all defend the Assad regime, and conversely, many Sunnis did not vocally support the uprisings. According to Dr James Zogby from the Arab American Institute (AAI), the “majority of the Christian Syrian American communities [as well] [were] quiet” because they did not support the Syrian government and were discouraged by some of the opposition groups’ sectarian rhetoric.10James Zogby, in-person interview, 11 May 2017(James Zogby, interview). The most widespread expression of solidarity among the Syrian American diaspora is financial donations to humanitarian relief efforts. This gesture of solidarity transcends religious and political divides. 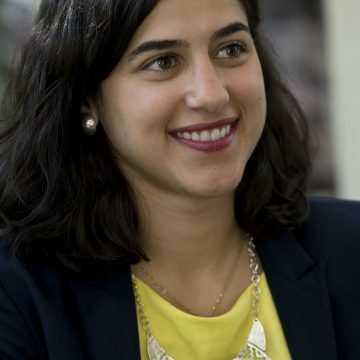 Initially, diaspora members only wanted to donate money to Syrians from the same religion, sectarian community, and region; however, donors loosened the conditionality of their donations and allowed humanitarian organizations to determine where money was needed most.11Jomana Qaddour, in-person interview, 11 May 2017 (Jomana Qaddour, interview). Nevertheless, as the conflict worsened, the seemingly apolitical act of donating to support humanitarian relief evolved and became politicized. Many Syrian American groups would only donate to organizations that shared their political views, and did not trust other groups to deliver unbiased aid. Among the participants interviewed, those who considered themselves neutral donated money to religious institutions to support humanitarian efforts. Some accused Syrian American organizations of selectively delivering aid to those from the same religious background, regions, or sectarian communities. Despite the divides, the Syrian American community has, according to interviewees, raised over half a billion U.S. dollars for humanitarian aid. As the conflict evolved, the pro-opposition and pro-government communities in the U.S. strengthened their expressions of solidarity by diversifying their fields of engagements. Solidarity was expressed through political advocacy, awareness raising, and student organizations. Public protests and demonstrations became a popular vehicle to raise awareness within the American public. Different groups organized rallies, demonstrations, and candlelight vigils to memorialize different events occurring in Syria or to influence U.S. government policy. For example, in 2013 Syrian Americans in Allentown, Pennsylvania continuously protested against U.S. intervention in Syria. Likewise, Syrian Americans supporting the opposition organized to lobby the U.S. government to condemn the Syrian government’s actions. Moss’s recent research demonstrates the influential role played by Syrian American organizations in raising awareness of human rights violations in Syria.12Dana Moss, “Diaspora Mobilization for Western Military Intervention during the Arab Spring”. Groups from both sides have lobbied for different legislative and military actions since the beginning of the conflict. This level of organization did not exist prior to 2011. After six years of conflict, diaspora groups have either disengaged from the Syrian conflict, adjusted their approach, or shifted focus to assisting refugees. Prior to 2011, many Syrian Americans were not comfortable with political advocacy and had little knowledge of how it was conducted. According to Kenan Rahmani from The Syria Campaign, “people had more faith that the politicians would play their role and figure out a political situation for Syria.” As such, individuals focused only on humanitarian efforts. However, as a result of their disenchantment with U.S. inaction, these groups began shifting towards more political engagement. The 2016 U.S. presidential election was a turning point for political advocacy. Syrian Americans continued making donations but also created structured political organizations in an effort to influence U.S. policy. The Free Syria Political Action Committee (PAC) was established to legally allow Syrian Americans to support congressional members who defended their agenda.13See Free Syria PAC, available at freesyriapac.orgSimilarly, the Syrian American Forumadvocated for the preservation of the Syrian state and against U.S. intervention. Other organizations, like the Syrian Community Network, were established to coordinate assistance for refugees and to integrate them into their new communities. Today, rifts between the diaspora have become more pronounced along political lines, most notably between those in support of the 2011 uprising and those backing the Syrian government. Syrian restaurants, cafes, and other social establishments in the U.S. have become battlegrounds, with pro-opposition sympathizers boycotting businesses owned by pro-government supporters and vice-versa. According to one interviewee, “the Arab Spring has divided the Arab American communities in the United States instead of bringing them together.”14James Zogby, interview. He believes the conflict has not only affected the Muslim-Christian divide in the U.S but has also exacerbated the Sunni-Shia divide. The pro-opposition Syrian diaspora community has experienced some internal fractures, especially along organizational lines as personal disagreements between some individuals in various organizations prevented further collaboration.15>Kenan Rahmani, in-person interview, 2 May 2017 (Kenan Rahmani, interview). These disputes wasted a significant amount of energy and resources, affecting the number of people benefiting from aid on the ground, decreasing the community’s credibility among policymakers, and weakening the solidarity within Syrian civil society. Another critical disagreement among the supporters of the opposition centres on U.S. involvement in the Syrian conflict. Some pro-opposition diaspora members vehemently oppose any military action in favour of a political solution, while others are persuaded that a political solution will only be achieved through military intervention. Other factors such as age, post-conflict visions for Syria (secular versus religious), as well as regional origin have amplified the divisions among the Syrian diaspora.16Jomana Qaddour, interview. However, mosques and Islamic organizations served to connect the Syrian community on the local and national level and many Syrians actively participated in establishing Muslim organizations, including members of the Syrian “old opposition” who established the SAC. Subsequently, after 2011 the divides among the opposition supporters intensified with predominately older males advocating for “conservative Muslims” while Syrian Americans from younger generations favoured a secular approach. Consequently, these two groups did not closely interact with each other. The youth made their voices heard on college campuses and through student groups, but often felt marginalized by the older generation that fled Syria in the 1970s and 1980s and who had experienced first-hand the Syrian government. Another divide was based on regional origins The Damascene populations grouped together as did Syrian Americans originally from Aleppo, Hama, and Homs. Communities from these four large cities banned together at times, additionally marginalizing diaspora members with origins from rural areas. These divides continue to be felt today, but to a lesser extent.17Kenan Rahmani, interview. 1. ↑ Research for this article was conducted through analyzing secondary literature and interviewing members of the Syrian American diaspora throughout the U.S. The interviews serve to provide an understanding of the behavioural dynamics between the diaspora groups. Every effort was made to maintain a gender balance among the interviewees: four participants were female and the remaining six were male. Participants were selected from states identified as having a large Syrian population or the presence of Syrian American organizations. The interviewees belong to various religious, ethnic, and professional backgrounds. Additionally, they have diverse regional origins in Syria and have spent varying amounts of time in the U.S.
2. ↑ Gaby Semann, "Arab Americans: Stereotypes, Conflict, History, Cultural Identity and Post 9/11", Intercultural Communications Studies Vol.23 No.2, 2014. 4. ↑ David Dyssegaard Kallick, Cyierra Roldan, andSilva Mathema, "Syrian Immigrants in the United States". 5. ↑ Jie Zong, “Profile of Syrian Immigrants in the United States”. 6. ↑ David Dyssegaard Kallick, Cyierra Roldan, andSilva Mathema, "Syrian Immigrants in the United States". 7. ↑ David Dyssegaard Kallick, Cyierra Roldan, andSilva Mathema, "Syrian Immigrants in the United States". 8. ↑ Omar Salem, telephone interview, 17 May 2017. 9. ↑ Dana Moss, "Diaspora Mobilization for Western Military Intervention During the Arab Spring", Journal of Immigrant and Refugee Studies, Vol.14 No.3, 2016 (Dana Moss, “Diaspora Mobilization for Western Military Intervention during the Arab Spring”). 10. ↑ James Zogby, in-person interview, 11 May 2017(James Zogby, interview). 11. ↑ Jomana Qaddour, in-person interview, 11 May 2017 (Jomana Qaddour, interview). 12. ↑ Dana Moss, “Diaspora Mobilization for Western Military Intervention during the Arab Spring”. 14. ↑ James Zogby, interview. 15. ↑ >Kenan Rahmani, in-person interview, 2 May 2017 (Kenan Rahmani, interview). 16. ↑ Jomana Qaddour, interview. 17. ↑ Kenan Rahmani, interview.